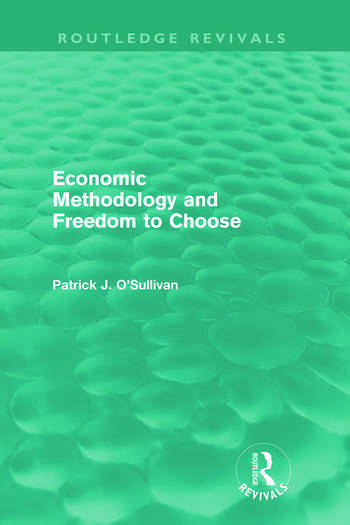 First published in 1987, Professor O'Sullivan's work provides an in depth philosophical examination of the foundations of method in Economics and other human sciences. The argument is unabashedly dialectical in the great Socratic-Platonic tradition, and the reissue will be very welcome to all students of methodology, in particular those students of economic methodology seeking a refreshing alternative to yet more mathematical game playing. In an age dominated and perhaps to an extent perplexed by an ultimately non-committal postmodernism the book provides a root and branch critique of the epistemological relativism which must lie at the root of the whole post-modernist approach; and in reasserting the fundamental importance not only for the methods of science but also for European civilisation of the pursuit of truth it takes a stance which is very much against the tide of the times. A heterodox perspective is also provided and defended in detail regarding the real nature of economic methodology whereby it is shown that Economics epitomises a teleological mode of explanation which is significantly different from the efficient causal modes of explanation of the natural sciences. In fact Economics is the ultimate subjectivist/interpretative discipline in the methodological sense of Max Weber and Alfred Schutz, a fact which has only been recognised (and welcomed) in the Austrian school of Economics.